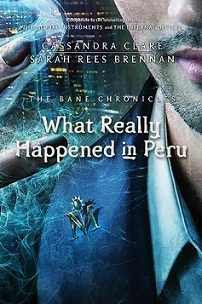 The first book of The Bane Chronicles, What Happened in Peru follows a few of my favorite warlock's adventures and shenanigans in Peru where Mr. Bane has his fellow warlocks Ragnor Fell and Catarina Loss along for the ride. The book takes us to Peru in 1791, 1885, 1890 and 1962. In his journeys Magnus drags Ragnor on a rain forest adventure which wouldn't be complete without a monkey encounter before they end up on the high seas and another year the three warlocks end up as wanted criminals. We learn that Magnus took up the charango and meet one of his past lovers. Of course this wouldn't be complete without drunk Magnus and enchanted carpets (take from that what you will). With all of Magnus' funny and serious moments you're in for a nice treat. 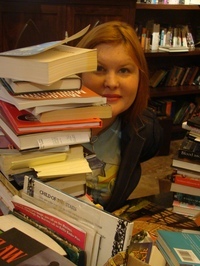 A must-read for all Infernal Devices and Mortal Instruments fans! "I thought it would be nice to start in the capital. Besides, I've been here before," Magnus said. "About fifty years ago. I had a lovely time, aside from the earthquake that almost swallowed the city." "Did you have something to do with that earthquake?" "Ragnor," Magnus reproached his friend. "You cannot blame me for every little natural disaster that happens!" "I will find you," Ragnor told him. "I will find whatever chest of absurd clothes you have. And I will bring a llama into the place where you sleep and make sure that it urinates on everything you possess." Moreover, I wish to assure both of you that I did not make any amorous advances on female monkeys." He paused and winked. "I didn't actually see any, so I never got the chance." "Magnus, Ragnor, I heard a cat making a most unearthly noise," she exclaimed. "From the sound of it, the poor creature must be direly sick. You have to help me find it!" "You are conspiring against me and my art," he declared. "You are a pack of conspirators." "Gracious," Magnus said. "I progressed to full hallucinations? It's official. That sounds like . . . almost the most drunk I have ever been. Please don't ask questions about the most drunk I have ever been. It's a very sad story involving a birdcage." Magnus tried to escape several times, and had to be forcibly restrained. Later Catarina and Ragnor liked to act out the time he tried to take the guinea pigs with him, reportedly shouting "Freedom!" and "I am your leader now."